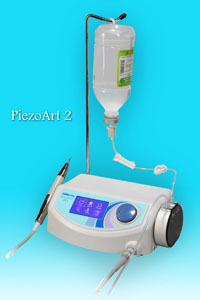 PiezoART is an ultrasonic bone cutting system is driven with piezoelectric technology. The PiezoART system is designed for Osteotomy and Osteoplasty used in Implantology, Periodontology, Endodontics and Orthodontic Surgery which features elaborated cutting for surgical precision and intra-operative sensibility, and selective cutting for hard tissues without causing any damages to soft tissues. PiezoART is equipped with automatic gain close loop control circuit that make Tips and Inserts vibration in the best frequency, ensuring Tips and Inserts can work in constant conditions with optimal power and efficiency. Control interface comes with a large graphical LCD display touch screen, and all of the system functions can be activated by simple touch of the screen and shuttle dial. It also comes in handy with a hands free 2.4GHz Bluetooth remote wireless pedal. Quality efficient water supply pump makes flushing and cooling quieter, more efficient and no need for external water source.